I met a woman last week that was trying (unsuccessfully) to sell her home. I began to explain what a realtor can do for her and she was stunned. She honestly believed that realtors just put a sign in the lawn and hope for the best. Sure some do that but not the majority. I’ll admit when I started in real estate I didn’t realize how little people think of realtors. I have heard realtors being compared to used car sales men, snake oil sales men and various other professions that people have little regard for. This has given some people the impression that realtors aren’t useful. We are in an age now where selling your house without the aid of a realtor is becoming quite common. I have had the pleasure of meeting several people that have tried to sell on their own or with the use of companies like ComFree. The comments I heard most often about why they chose to sell on their own was that they didn’t want to pay the commission and that they can do anything a realtor can do but better. 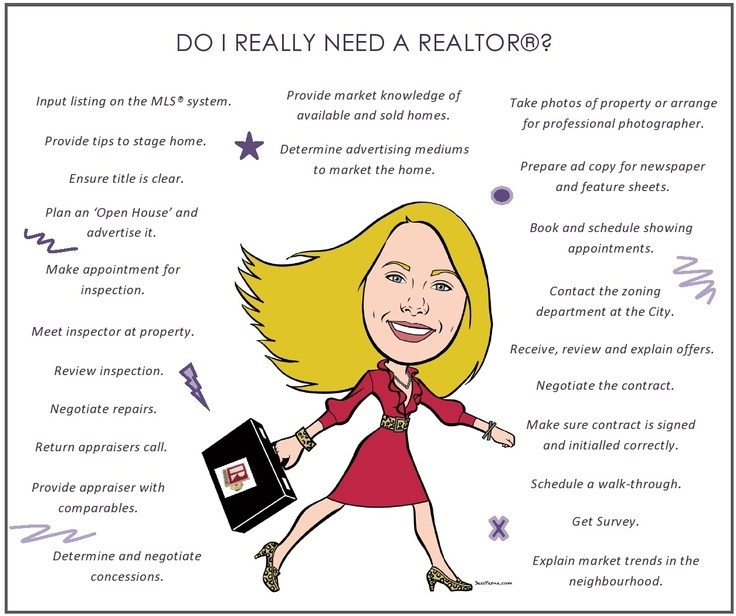 So let’s dive into a what a realtor can do for you…. After the sign goes in and your listing has been put on MLS, the work really begins. The sale price of a home isn’t a random number. Before listing a property a realtor will do a comparative market analysis of all the sales in your area over the past few months to a year. They compare similar builds with similar features, for example, 2 bathrooms, a pool, number of bedrooms etc. This helps them come up with a suggested selling price. A realtor will come up with a plan to market your home. Whether through print ads in the newspaper or posts on Facebook, your realtor is going to get people to pay attention to your listing and try to draw in as many people as they can. Many home owners feel that open houses are a crucial part of the home selling process. They do get a lot of people through. Some are nosy neighbours, some are serious buyers and some just go to open houses as a hobby. Open houses generally last for 2-3 hours and are often held on the weekend. I have met more then one FSBO that has said they do not like doing open houses. I have also met more then one buyer that said going to a FSBO open house can be extremely uncomfortable. Congratulations you got an offer! Now what? If you are selling on your own you will probably ask a lawyer to look over the offer and make sure everything is in place. Thing is lawyers know real estate law they do not deal in real estate as a profession. They do not know the ins and outs of offers, they will not help you with home inspections or necessary repairs, nor will they help you negotiate on your behalf, but a Realtor will. It is our job to get you the most money possible for your house. Realtors can negotiate everything from price, to closing dates to whether or not to include the family cat as part of the sale (yes it happens) and everything in between. Like I said, it is our job to negotiate. If we can’t do our job we don’t get paid. Home inspections are pretty important. They give both the seller and the buyer peace of mind. For a seller a home inspection allows you to rectify any issues that may come up prior to closing which will ensure that the buyer can not back out of the deal. On the buyers end they feel secure that the home they are buying is a sound investment. Your house is sold and you are still searching for your new home but you can’t find one that you like. Yipes! A Realtor can help with that. We will search for you, arrange times to view the properties, and prepare an offer for you if you find a house you love. Realtors are not trained in the art of therapy but on a regular basis we are talking people down off the ledge. Real estate can be terrifying and stressful for some. There is a lot of money on the line and remorse can set in the second that you accept an offer or purchase a home. Since your Realtor has no emotional ties to any house they can give a calm and unbiased opinion of the situation. Agents often suggest staging using what you already have. Simple tricks like rearranging your furniture, removing personal items, and removing clutter can add thousands of dollars to your bottom line. Realtors are also in contact with professional stagers. They can bring in rented furniture and do all of the work for you. As you can see Realtors do a lot aside from putting in the For Sale sign. We take pride in our jobs and only want the best for our clients.